The National Athletic Trainers’ Association is the professional membership association for athletic trainers and those who support the athletic training profession. 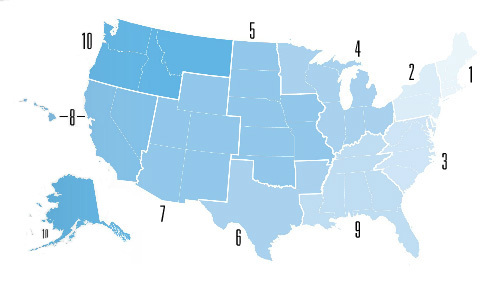 NATA is segmented geographically into ten districts, each of which is comprised of a district association and state associations that operate independent of NATA. Membership to NATA automatically includes districts and state memberships as well, for all NATA members located within the United States or its territories. These district and state organizations develop their own bylaws and policies, select officers and create unique programs. The membership of each district association elects a director to serve on the NATA Board of Directors. To learn more about a district or state association, click on the map, or select a District or State link below.